Another objective of the Matyjaszewski group is to interact with other research groups to develop an understanding of the properties of materials prepared for the first time by CRP. However, since the properties of the materials prepared by CRP can be "adjusted" by many subtle and presently unexplored ways, we use the word "evaluation" in the title of this section to indicate that the study is by no means complete. We hope the following brief overview might give you some ideas on how to construct materials with the spectrum of properties required by your target application. 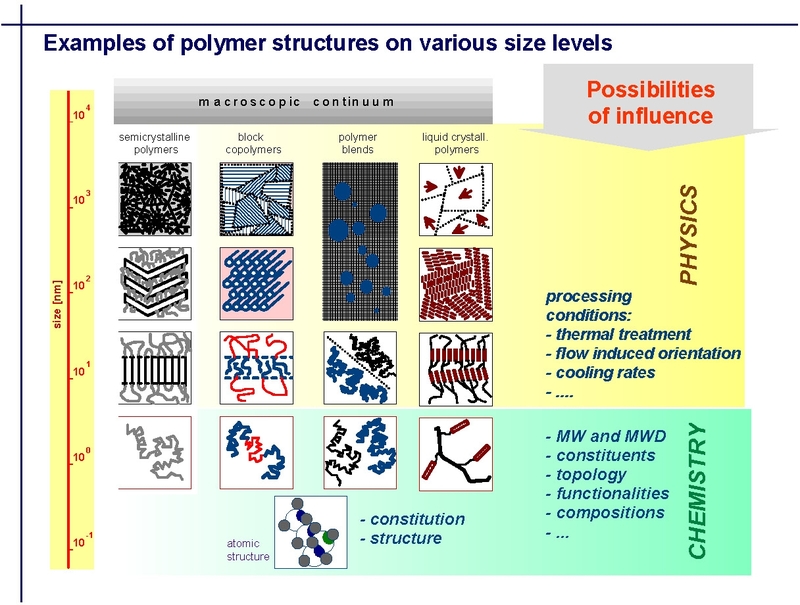 Many of the following slides were provided by Professor Tadeusz Pakula from the Max-Planck-Institute for Polymer Research, Mainz, Germany who had collaborated with the group for over a decade. The slides are taken from a presentation made at the March 2005 CRP Consortium Meeting. The slides have been selected to show how the bulk properties of a material depend on the structure, size scales and heterogeneity of the material, and the dynamics, or time scales, of the test, and how the response rates of the polymer to stress ultimately depend on molecular structure. They illustrate how different molecular elements on a macroscopic continuum are affected by the physics of processing and how they interact with the chemical parameters controlled by synthesis. They are presented here in order to provide a foundation from which to understand or learn from many of the figures presented later on this page, that are discussed in greater detail in papers co-authored by Professor Pakula and Professor Matyjaszewski. 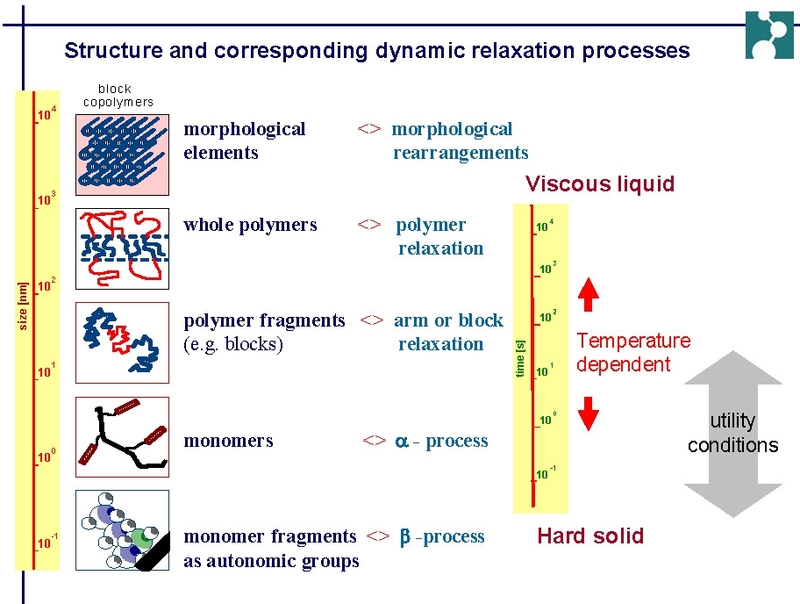 The first slide illustrates how the macroscopic continuum of phase separation in a polymer can be influenced at different levels by physical or chemical manipulation of the material. The next slide illustrates how the physical properties of a material are dependent on the composition or morphological elements of the material and how the scale of the dynamics of molecular motion change with temperature. In many of the following figures, changes in polymer dynamics over several orders of magnitude have been measured using mechanical spectroscopy. The final spectrum is constructed from mechanical spectroscopy measured over a fairly narrow frequency range at different temperatures. When the curves are fitted together they provide an illustration of mechanical response over a wide range of physical environments. The following figure shows the spectrum of a linear polyisoprene. 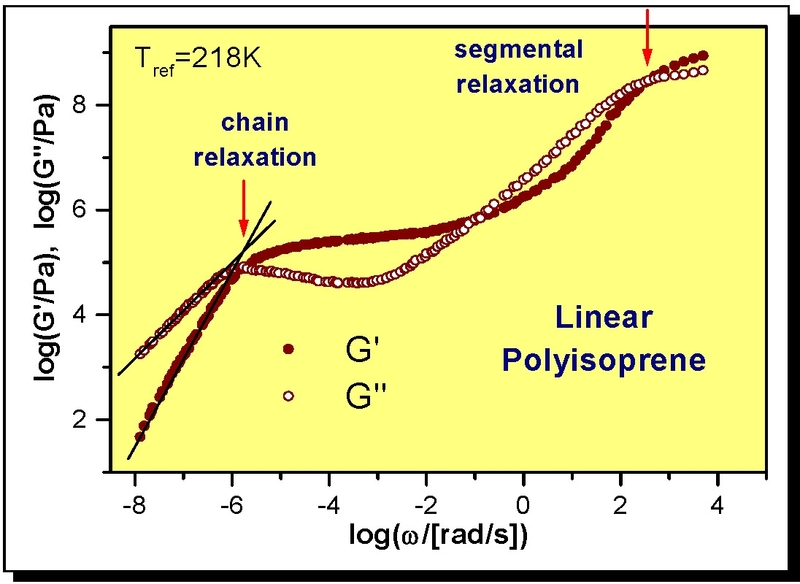 The figure clearly shows the transition from the glassy state through segmental relaxation, transitioning into a rubbery state, seen as a plateau, prior to chain relaxation and polymer flow. There are a multiplicity of materials that could be discussed in each of the following topical sub-headings but we will focus on a very few examples that were selected in the hope they show how materials prepared by CRP differ from materials prepared using earlier polymerization processes. Small changes in the molecular weight result in changes in the segmental relaxation, meaning that chain relaxation rate is strongly dependent on the molecular weight, and an increase in the molecular weight results in an extension of the range of the rubbery behavior. Gradient copolymers could not be prepared until a robust Controlled Radical Copolymerization (CRP) was developed. (2) Until recently the(3) cross-propagation kinetics in "living" ionic processes did not allow synthesis of such materials. 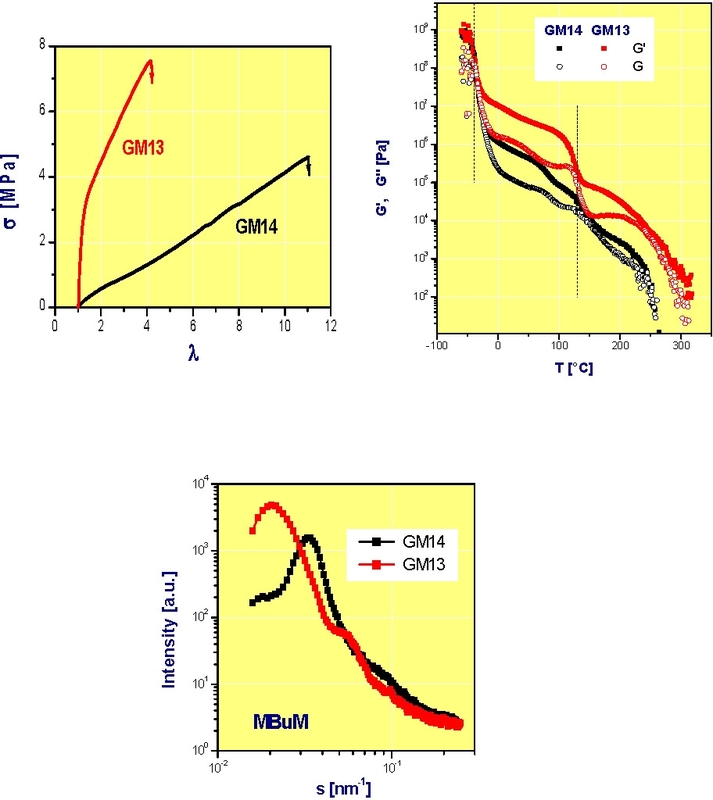 The initial paper on properties of gradient copolymers(4) provides a comparison between the properties of a styrene-methyl acrylate gradient copolymer (G2), a random copolymer (R1) and a block (B1) copolymer, each with the same overall composition. 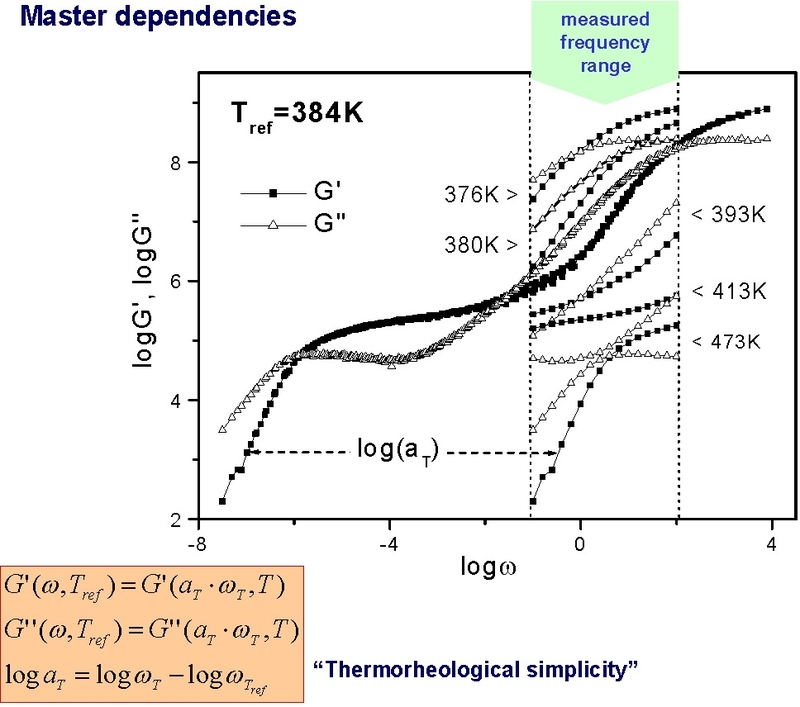 The following figures show the DSC thermograms and the temperature dependencies of the storage (G') and loss moduli (G'') for the three materials. The extraordinary broad temperature range for the segmental relaxation in the gradient copolymer is due to a wide spectrum of compositions within the chain. As a transition to the next section, focusing on block copolymers, the following figures are taken from reference 4 and show how the properties of an ABA block copolymer can be changed by incorporation of a low concentration of a second monomer into the A blocks. The polymers are GM13, a clean ABA block copolymer (MMA131-BA507-MM A131), and GM14, a copolymer with a fraction of the B-monomer in the A-blocks (MMA115/BA15)-BA527-(MMA115/BA15). The presence of a gradient of composition along the backbone of the A-blocks leads to a block copolymer with reduced ultimate stress but much higher ultimate elongation than the comparable block copolymer with pure MMA A-blocks. (1) Denizli, B. K.; Lutz, J.-F.; Okrasa, L.; Pakula, T.; Guner, A.; Matyjaszewski, K. Journal of Polymer Science, Part A: Polymer Chemistry 2005, 43, 3440-3446. (2) Greszta, D., 1997; p 276 pp. (3) Park, J.-S.; Kataoka, K. Macromolecules 2007, 40, 3599-3609. (4) Matyjaszewski, K.; Ziegler, M. J.; Arehart, S. V.; Greszta, D.; Pakula, T. J. Phys. Org. Chem. 2000, 13, 775-786. (5) Wang, T.; Liu, F.; Luo, N.; Ying, S.; Liu, Q. Hecheng Xiangjiao Gongye 2001, 24, 328-330. (6) Kim, J.; Zhou, H.; Nguyen, S. T.; Torkelson, J. M. Polymer 2006, 47, 5799-5809. (7) Wong, C. L. H.; Kim, J.; Roth, C. B.; Torkelson, J. M. Macromolecules 2007, 40, 5631-5633. (8) Goebelt, B. FATIPEC Congress 2004, 27th, 303-312. (9) Kim, J.; Mok, M. M.; Sandoval, R. W.; Woo, D. J.; Torkelson, J. M. Macromolecules 2006, 39, 6152-6160. (10) Pakula, T. Macromolecular Theory and Simulations 1996, 5, 987-1006. (11) Lutz, J.-F.; Pakula, T.; Matyjaszewski, K. ACS Symposium Series 2003, 854, 268-282. (12) Vidts, K. R. M.; Dervaux, B.; Du Prez, F. E. Polymer 2006, 47, 6028-6037.